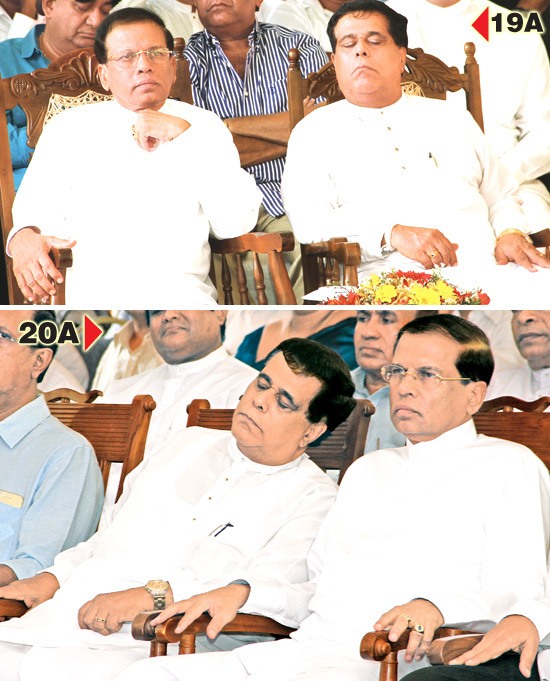 Message in a snooze : In what appears to be a not so subtle indication about what the Opposition thinks about constitutional amendments, Opposition Leader Nimal Siripala de Silva is once again caught snoozing, this time at a public discourse on the proposed 20th Amendment to the Constitution. He was caught in a similar snooze during a discussion on the 19th Amendment to the Constitution. What’s the odds both historic snoozes would be captured by the same photographer? The State-owned Chinese company that initiated the Colombo Port City Project worth US $ 1.4 billion has failed to produce the Cabinet approval and the vital environmental clearance certificate on the feasibility of the project, Finance Minister Ravi Karunanayake said.